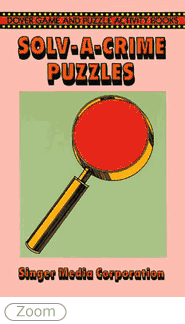 Forty-seven mini mysteries filled with the works of sometimes clever, sometimes clumsy murderers, thieves, and liars. Using deductive powers, young crime solvers can break the cases of the Dead Dancer, the Bruised Blonde, many more. Each case is presented in a brief, two-page profile. With solutions.